This is our Thunderbolt. 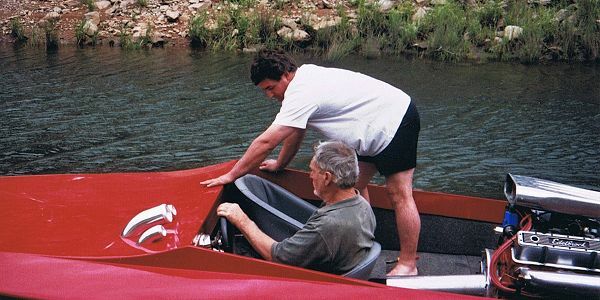 My father started building the boat in the 70's in Canada. 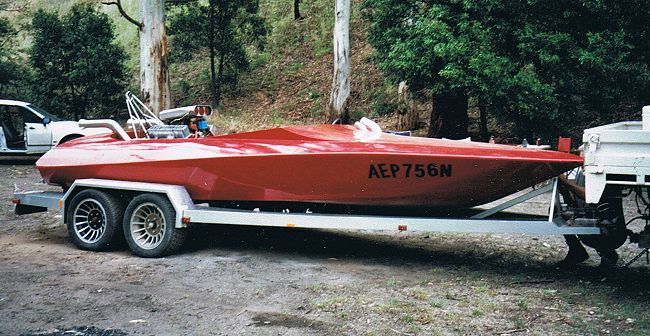 Then imported it into Australia a short time later and continued to build until the early 80's. Then the project got shelved until '98. We re-started working on the boat but by that stage the boat had a lot of dry rot so we replaced all of the deck and repaired some of the bottom of the boat. Then the modifications started. We cut the beams down and steel them out so we could get a flat floor, which in turn gave us the problem of leg clearance under the dash. So we raised the dash 3 inches. The back of the transom near the motor was flattened out then we sculled out the area underneath the over transom exhausts. We fiberglassed the boat and painted it. Then started the building of the motor, which is 350 010 4 bolt main Chev. It was bored 60 thousanths then flat top forged pistons, steel crank and xo rods where fitted. The fueley heads were then bolted down. The Edelbrock manifolds and quardrajet carby feeds the fuel into the engine. I then made the aluminum fuel tanks. We then fitted the underwater gear and the mechanicals to the boat.